In Rock Creek Park, native insects play a vital role in natural communities , but non-native invasive insects threaten to overwhelm some natural communities. Why are non-native insects any more disruptive than native ones? 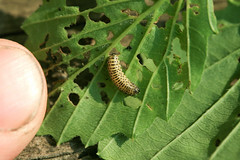 Ecobit: The Making of a Pest Not all of the insect pests listed below have reached or infested Rock Creek Park, but all are likely to do so without vigilance. 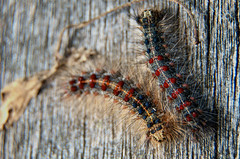 Colorful gypsy moth caterpillars (Lymantria dispar) are destructive to oaks and many other species. Photographer: Flickr user Dennis WilkinsonThe gypsy moth (Lymantria dispar), native to Europe and Asia, became established in America about the same time Rock Creek Park was founded, and reached the mid-Atlantic region by the late 1900s. You can check out the Plants and Animals page of any of Rock Creek Park's natural communities and see that oaks grow in all of them. The potential impact of gypsy moth is obvious in oak-dominated communities like the Chestnut Oak / Mountain Laurel Forest or the Mixed Oak / Heath Forest. 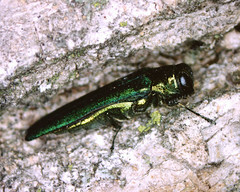 An adult emerald ash borer (Agrilus planipennis). Photographer: U.S. Department of Agriculture.The emerald ash borer (Agrilus planipennis), originally from Asia, has the potential to wipe out most of the ash trees of Rock Creek Park. The emerald ash borer is present in the parks of the National Capital Region, which includes Rock Creek Park1. Rock Creek is home to green ash, white ash, and perhaps pumpkin ash. Green ash is a significant part of the park’s Red Maple Seepage Swamp and the Tuliptree Small-stream Floodplain Forest. It tolerates flooding, and is an important natural part of erosion control on floodplains. White ash occurs in the Basic Mesic Hardwood Forest of Rock Creek, and occasionally in the Mesic Mixed Hardwood Forest. 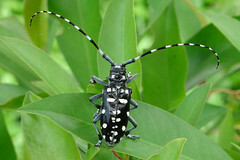 Asian long-horned beetle (Anoplophora malasiaca). Photographer: Changhua Coast Conservation ActionThe Asian long-horned beetle (Anoplophora glabripennis) can kill mature trees of many species. The beetle has not yet appeared in Rock Creek Park, but Park staff members are watching for it. Host trees include maple, box-elder, elm, birch, sycamores, and willows—all found in the Tuliptree Small-stream Floodplain Forest at Rock Creek. Maples are also especially common in the Basic Mesic Hardwood Forest. A viburnum leaf beetle larva (Pyrrhalta viburni) on a skeletonized Viburnum leaf. Photographer: Flickr user dogtooth77A Eurasian beetle called the viburnum leaf beetle (Pyrrhalta viburni) attacks viburnum plants and can kill them with repeated infestations. By 2014, the viburnum leaf beetle had not spread southward as far as Rock Creek Park, whose most common native viburnums—southern arrow-wood and mapleleaf viburnum—are among the most susceptible to infestation. Since the beetle requires moist soil (neither too dry nor too wet) in which to mature2, the viburnums at Rock Creek most at risk would be found in natural communities like the Basic Mesic Hardwood Forest, the Tuliptree Small-Stream Floodplain Forest, and moister variants of the Mesic Mixed Hardwood Forest. Ironically, some of the park’s non-native, invasive viburnums—among them Japanese snowball*—are somewhat resistant to the viburnum leaf beetle. 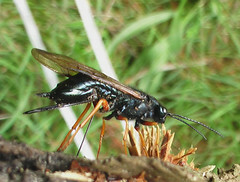 Photographer: MichaellbbeckerThe few lingering pine trees at Rock Creek could face a new threat: sirex woodwasp (Sirex noctilio)—imported from other continents. No sightings of woodwasp had been reported in the District of Columbia as of 2014. 1. National Park Service. 2016. 2016 Ash Trees. 2. University C. 2016. Viburnum Leaf Beetle.